If you’ve ever attended a FootLove Yoga workshop or maybe even one of my classes, you have have rolled a lacrosse ball on the bottom of your foot to loosen up the fascial tissues and provide a strong sensory nerve experience. 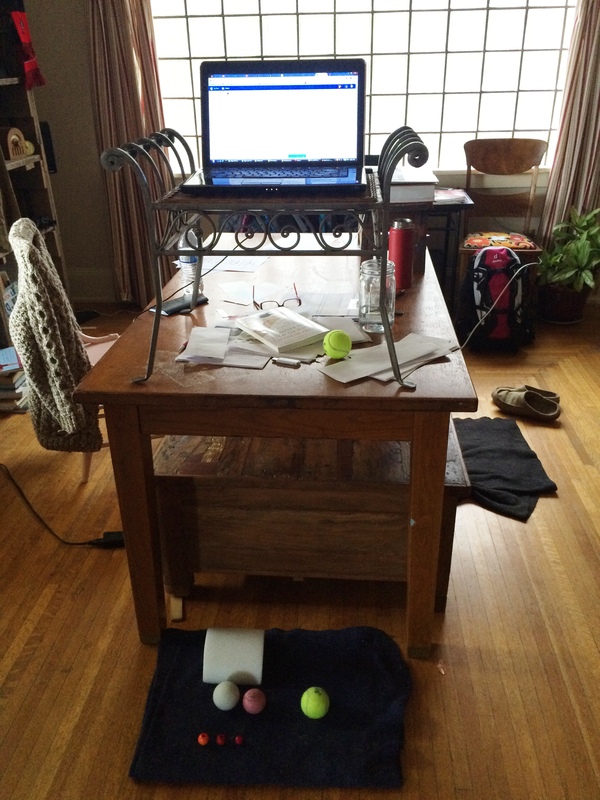 Since beginning to stand at my computer station a few months ago, I have begun to crave these ball sessions, but using softer balls like tennis and racquet balls, and allowing my foot to rest quietly on the ball. As I’ve said before, your feet evolved primarily for walking on varied terrain with hills, bumps, divets, sharp rocks, smooth stones, roots, holes, sand, dirt, grasses, leaves, brambles, water, slick, sloggy, hard, soft – deforming their 33 joints (each!) in a nearly infinite number of positions while naked. The contours of the earth helped to keep our feet supple. While I’m at my standing desk, I use balls of various sizes, textures, and yielding properties to drape my feet over, one foot at a time. After several minutes, I may start to very slowly move my foot over the ball, but often I stay still and try to be present to the innervation or waking up of these areas. Exploring various shapes with your soles stretches your muscles and joints in ways that you likely won’t experience unless you are walking on the natural earth with your feet bare. If your feet have been immobile for a long time, start slow, with soft balls & shapes, for small amounts of time. 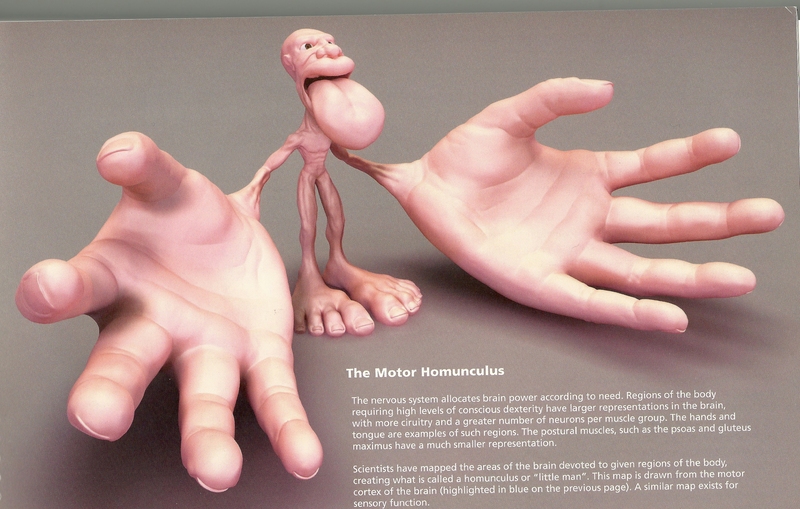 What’s New in Foot & Ankle Science? It’s 3:28 a.m. and I am standing at my computer station stretching the top of my foot (will post this exercise soon) and browsing abstracts from the Journal of the Podiatric Medical Association. Yup. That’s what I do on a Friday night. Technically, it’s Saturday morning because I have been to bed, but was rooted out by my dog, Jolie, who makes the occasional appearance in FootLove Yoga videos and pics. I thought it might be interesting to share with you some peer-reviewed research conclusions from the main trade group of podiatrists (foot docs) in the US. Bear in mind, that you are receiving my cherry-picked extractions from abstracts that can only be understood and evaluated in the context of their full articles and require knowledge of how to evaluate research methods. That is the buyer beware. My intention is only to bring your attention to what is being studied and learned. [In brackets you’ll find my snarky 2 cents]. Ill-fitting shoes may precipitate up to half of all diabetes-related amputations and are often cited as a leading cause of diabetic foot ulcers (DFU), with those patients being 5 to 10 times more likely to present wearing improperly fitting shoes. The current study, performed in a male veteran population, is the first such effort to examine the prevalence and extent of change in foot length affecting individuals following skeletal maturity. Nearly half of all participants in our study experienced a ≥1 shoe size change in foot length during adulthood. We suggest that these often unrecognized changes may explain the broad use of improperly sized shoe wear, and its associated sequelae such as DFU and amputation. 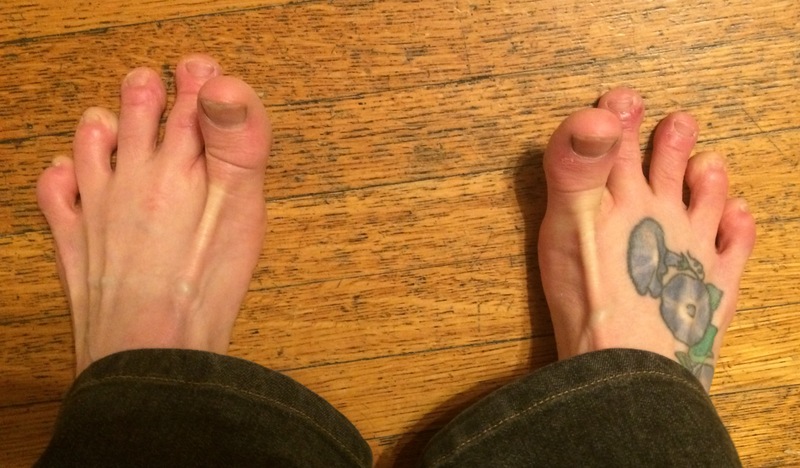 [Your feet are getting bigger, so should your shoes]. Participants walked more slowly and took shorter steps when wearing standard socks. Participants rated nonslip socks to feel less slippery than barefoot and standard socks. Compared with wearing standard socks, wearing nonslip socks improves gait performance and may be beneficial in reducing the risk of slipping in older people. I hope you enjoyed this literature review! Good news is that if you continue to exercise your feet, spend more time barefoot, and make better shoe choices (thin, flat flexible sole with a wide toe box) your feet will get stronger and more flexible and the cramping will diminish and disappear for good. I first learned of an exercise I call Marble Bridge from an article by Robin Rothenberg in the trade magazine Yoga Therapy Today. Robin learned of it from her colleague John Childers. I lean on their language to describe how and why it works. Hold a marble or large bead with the toes of your right foot, curling your toes around it as you would if you were making a fist with your hand. If you don’t have a marble, you can pretend to hold one, but it doesn’t work as well. 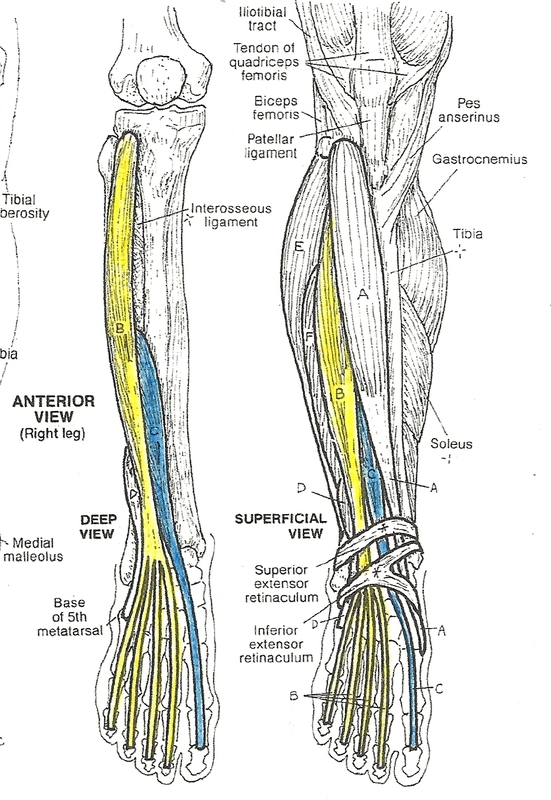 The action of grasping the marble strongly contracts the flexor muscles on the bottom of your foot; while the action of pointing your foot strongly causes a contraction through the Achilles tendon all the way up into your calf; at the same time you are deeply actively stretching the extensors on the top of your foot and front of your lower leg. This is a perfect storm of eccentric contraction that strengthens your muscles, increases the range of motion in your feet, and improves circulation and waste removal to your lower legs & feet, especially the heels that receive little blood flow and are ground zero for plantar fasciitis. Both Rothenberg & Childers use this exercise to treat clients with plantar fasciitis. Rothenberg explains that the plantar fascia is often “locked long” or, put another way, chronically tensed in extension. The fix for tissues in this state is to strengthen them, since chronic tension makes them weak, and simultaneously use strong contractions to counter the state of chronic extension. She combines undulating stretching with strong contractions. She cured her life long plantar fasciitis this way. You can watch a video of this exercise on FootLove Yoga Facebook page. Stop Distributing Your Weight Evenly Throughout Your Feet in Yoga! I intended to post something on feet every day in January, but alas, embedded in all the knowledge I picked up at the gait workshop that I attended in Seattle (Walking the Lines: Anatomy Trains, Myofascial Efficiency & A Model of Gait), was something that feels like the flu. I’m using my down time to read about the anatomy of feet and yoga, and was inspired to comment on a common yoga cue that I’d like to see go away. 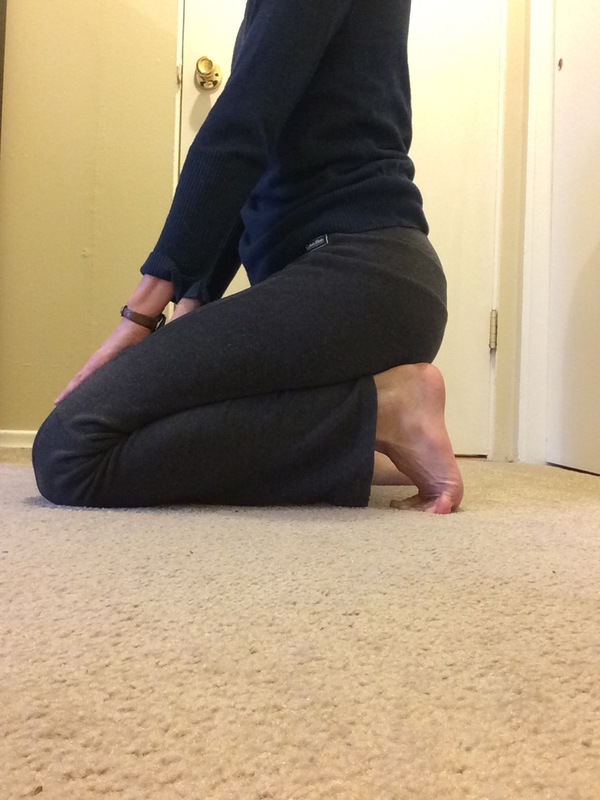 You will hear some variation on this cue for Tadasana (mountain pose) in many yoga classes. Unfortunately, its not good instruction. If you follow this improper cue, then you will have an unnatural, strong forward lean of your body. 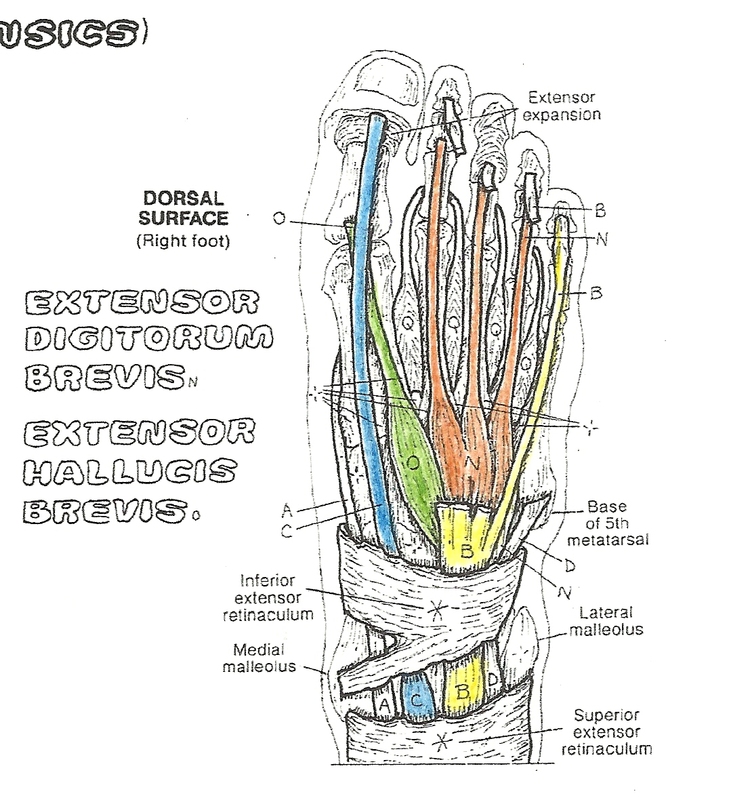 The architecture of the foot is elegant and intricately complex on an a deep anatomy level, but quite simple on a gross level as pertains to weight bearing. Your heel bone (calcaneus) is the largest bone of your foot and is structurally located precisely below where the weight of your body is translated to the ground. Your lower leg bones and those of your feet make up your ankle joint, which is located above your strong, weight-accepting heel bone, not above the smaller bones (tarsals) and more slender bones (metatarsals) of your mid and forefoot, respectively. These smaller bones are meant to assist in transfer of weight during gait, propulsion of your body forward, and in supporting your arches but NOT to hold the mass of your weight. I go over this in more detail in my post on backing up your hips. Even the cue to have “the majority” of your weight in your heels is not specific enough. The majority could be 60% and that is not enough weight in the heels. ALL of your weight should be borne by your heels. So if all of your weight is back in your heels, what is the rest of your foot doing? Wouldn’t it be lifted up off the ground? No.This is where your strong yoga foot comes into play. You can apply pressure to the ball of your foot by pressing it into the ground, without shifting your weight or hips forward. 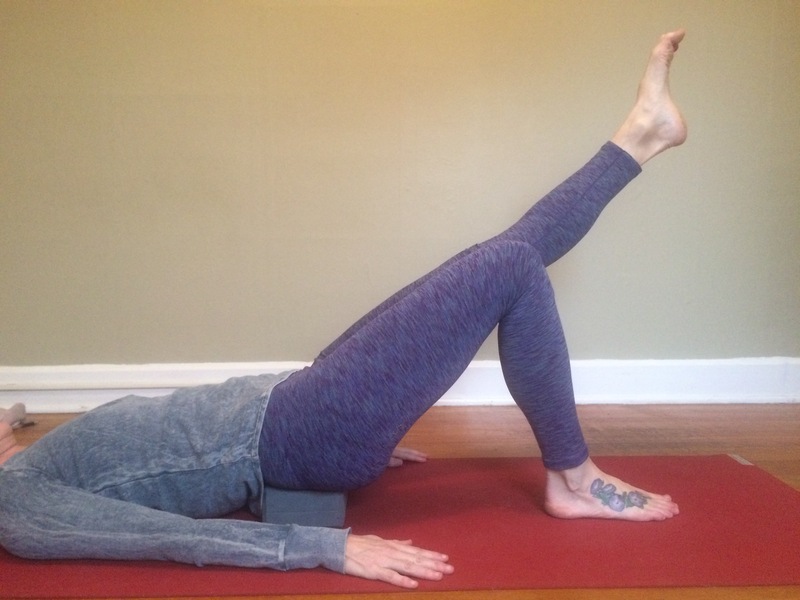 Make sure to back your hips up until a side view in a mirror would show your hip joint directly over your knee joint directly over your ankle joint with all three joints stacked directly over your strong, meant-for-this-purpose calacanei. Having a partner press their hands down firmly on the tops of yours shoulders should give you a sense of whether or not your weight is all the way in your heels. If it were spread evenly throughout your feet, you could buckle under the weight of your partner’s hands. If your weight is back, you can easily stand strongly under this downward pressure because you are using the vertical structure of your bones to resist downward force. This is how you do Tadasana – not because it is part of any particular yoga lineage, but because it is optimal for the health of your feet. What’s the big deal if you are only doing Tadasana a few minutes per yoga class? Because what you do on the mat often translates to what you do off of the mat – both the helpful and the harmful. This is how you do standing in line at the grocery. This is how you do standing around with a group of friends. This is how you do standing. You learned in my first post on Plantar Fasciitis that stretching the plantar aponeurosis aka fascia is associated with better outcomes than other conservative, conventional treatments including anti-inflammatory medications, corticosteroid injections, and both custom and over the counter orthotics. In addition to stretching the tissues statically, you can functionally stretch the plantar fascia by simulating the tensioning of the plantar fascia that occurs during the propulsion phase of gait (walking). Three variations of the static stretch are provided in order of intensity, followed by a link to a video of the dynamic, functional stretch. 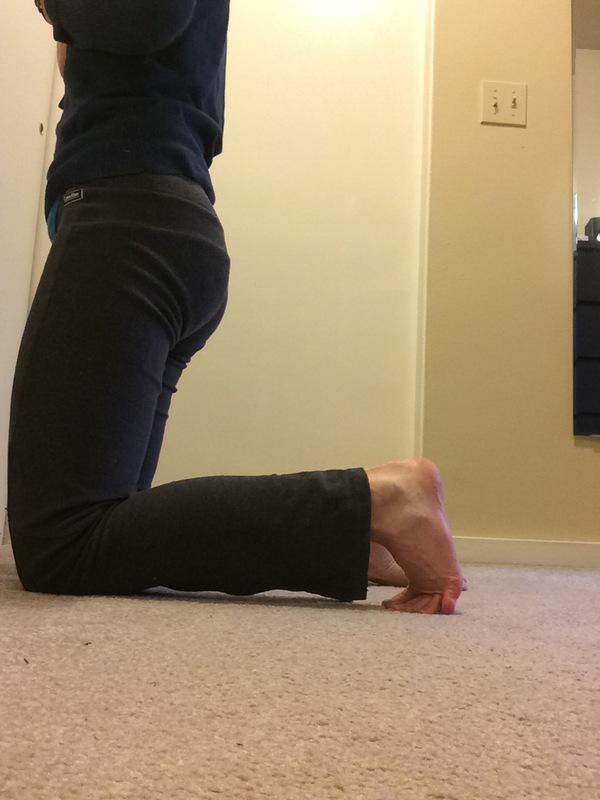 Stand up on your knees with the dorsal (top) sides of your feet and toes touching the floor. 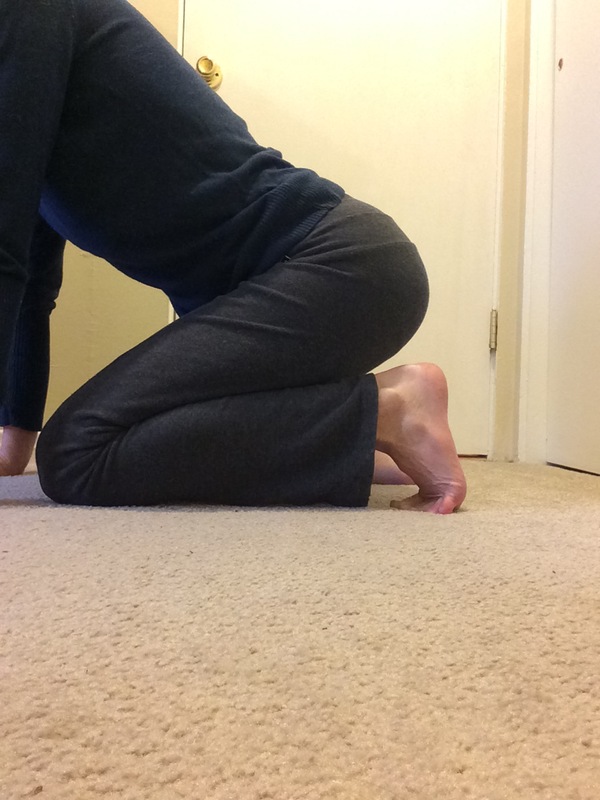 Be on your hands and knees with the dorsal (top) sides of your feet and toes touching the floor. Note in the photo above that I did not get my pinky toe extended forward. I should have reached around to coax that lil puddin into extension. In any of the variations, try to reach back to your foot and massage the fascial tissue in a crosswise direction, providing an additional myofascial release of these sticky tissues.